Two Democratic candidates for president — Bernie Sanders and Pete Buttigieg — have lately been set apart from the rest of the large field in at least one corner of the national media, according to our latest weekly analysis of cable television news coverage. In addition to watching polls and endorsements, we’re tracking every mention of the 2020 Democratic primary candidates on CNN, Fox News and MSNBC.1 Last week, a Vermont senator and an Indiana mayor were the hopefuls cable viewers heard about most. Vermont Sen. Sanders was mentioned in more than 660 clips last week across the three cable networks, out of the roughly 95,000 brief, 15-second news clips into which the television data is sliced2 — nearly twice as often as Buttigieg, who was in second place, and an increase of over 19 percent from the week before. The number of clips in which the Indiana mayor was mentioned, meanwhile, continued a steady rise that began back in mid-March: Last week, he saw an increase of 68 percent from the week before and new highs across all three networks that far eclipsed the meager noise he made when he entered the primary race back in January. It wasn’t an especially noisy week on cable news for every candidate, however. Beto O’Rourke, most notably, continued a precipitous fade in the TV discussion; the number of clips in which he was mentioned fell 55 percent from the week before. 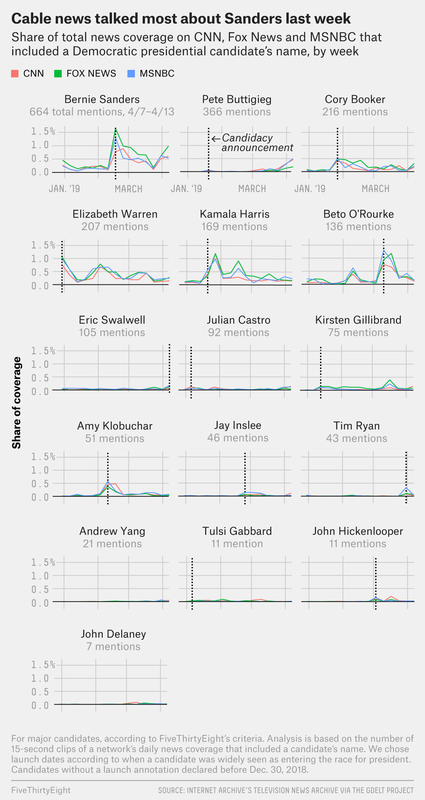 And some candidates had naught to cling to but dubious achievements: In pure percentage terms, Tulsi Gabbard saw the biggest increase in mentions last week — 1,000 percent — she went from a single mention to 11 mentions. We’ll continue to keep an empirical eye and ear on cable news as the next [checks calendar] 65 weeks until the Democrats’ convention and 81 weeks until Election Day unfold. Don’t touch that dial.